Budget offers a wide range of products and services at incredibly low prices in Australia. These Budget promo codes expire soon, so don’t forget to bookmark this page now. Budget free delivery offer: Reserve car for 5 or more days from Budget to receive $20 savings on standard rates. Limited time Budget coupon: Rent a luxurious SUVs from Budget and save $20 with your booking. New Budget discount: Use Budget mobile app for your booking car to receive $10 savings on standard prices. Latest Budget promo code: Rent a selected car for 4 days from Budget and receive 4th day for free. Exclusive Budget voucher codes: Hire an economy or a full size car for 2 or more days at Budget and get a free single day upgrade. Seasonal Budget deal & sale: Get regular promotions, top tips on car renting and exclusive offers when you sign up for Budget hot deals. Budget Car hire and Rental Australia are one of the largest car and truck rental companies in Australia. They offer a large range of cars, 4WD’s and minibuses for rent, as well as a large fleet of trucks and assorted commercial vehicles. Budget is located at more than 190 locations across Australia. Budgets diverse felt is constantly being updated in order to stay the most competitive and cost effective for the customer. Budget has a number of sister companies that specialize in different kinds of transport rentals. Budget Trucks provides individuals and businesses with Truck, Bus, utility and other heavy vehicle rentals. Budget partners with a number of different companies across the Airline Industry, Hotels, and Credit card providers. These partnerships allow them to set up many benefits and package deals with customers, such as Flybys points, Hotel discounts and more. Partner Companies include: Quantus, JetStar, Flybuys, American Express, Best Western. People need to hire vehicles for a raft of different uses. Whether you are moving house and need a storage truck, or you are planning a road trip around Australia and want a cheap-to-run car, Budget Cars have a large range of well-maintained and cost-effective fleet vehicles to serve any purpose. Cars: Hatchbacks, 4WD’s, Vans, Sedans, SUVs, Hybrids, and more. Truck/Bus/4WD: Vans, Utilities, Moving Trucks, Trailers, Minibuses’, Mining Vehicles, and more. Browsing through the Budget fleet is easy. You can view their range of cars on offer by simply clicking on the car category tab. To view their range of Trucks and Heavier vehicles—you can switch to the Truck/Bus tab category, and it will take you to the Budget Truck’s sister site. Want to rent a car, bus or truck? Avis is always the best option because it provides low rate for luxury cars and gives huge discounts on online reservation. Also, for more discounts on your getaway you can always save a huge by using Otel.Com promo codesSpeaking of discounts InsureandGo is here to get your travelling insurance covered along with some exclusive discounts online. Budget has a section where they detail great places to visit in Australia; including the weird, wonderful and strange. They also provide tips for car renting, saving money, and information on different hotspots. It always pays to read the terms and conditions before you rent a vehicle. Budget offers a terms and conditions document on their website detailing the expectations of the company as well as the renter; including specified uses, rules, and consumer rights. Budget rentals offers a large range of car brands across their various rental categories: Nissan Pulsar, Hyundai i20, Toyota Camry, Holden Commodore, and many more. Just use our voucher code to grab the most useful online services like car rental, parking and more at discounted price. Be sure to check out the special offers section for promotions and discounts on rental deals across the different categories. There are many options for saving money, collecting Flybuys points, Quantus points, Weekend deals, long term rental deals, and more. 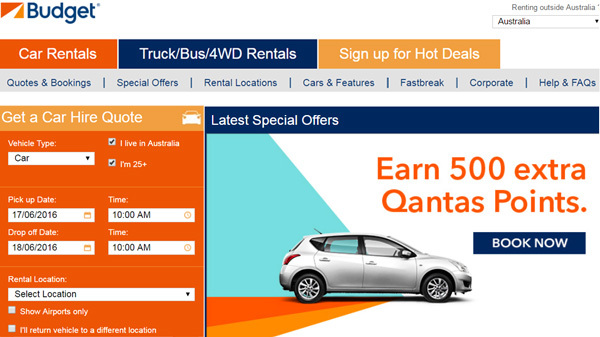 Rental car deals Australia – 5th day free on 5 days booking package. Get car on rent for 10 days and only pay 8 days cost. 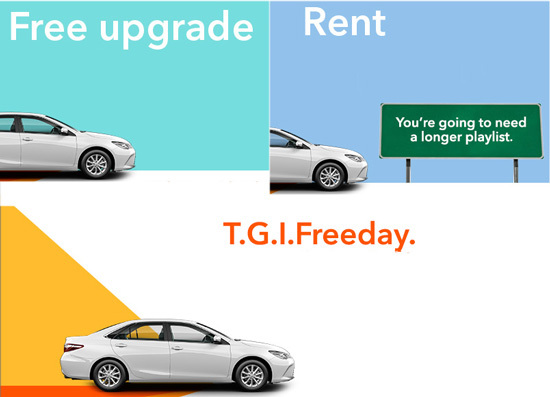 Grab free upgrade facility on 2 day rental. Select the offer that you want. Select vehicle type, age, pick up, drop date, timing and rental location. Enter voucher code in given text field. Then your new deducted amount will appear. It is very important to have the ability to get a hold of someone when you are renting a vehicle. In case something has gone wrong, or if you have any questions — the below methods are the best places to start to get customer support. Visit the FAQ section of the website for answers to common questions. Contact someone directly with one of the methods under “contact details” below. Check out Budget Car Rentals Australian YouTube channel. It offers content on current promotions and ongoing offers. Signing up with Budgets FastBreak membership service which ensures access to multiple benefits. Skip booking over the counter — no waiting or paperwork. Your credit card info is stored securely. Fastbreak service is available at many airports worldwide. Present an ID, they will prepare your agreement and direct you to the rental.